Kathy Bates and Chuck Lorre team up to get high in a comedy series for television due this August. Twenty episodes have been ordered by the online entertainment company Netflix. The American Horror Story veteran and star of other frightening film roles plays a lifelong advocate for legalization, who is finally living her dream as the owner of an L.A.-area cannabis dispensary. 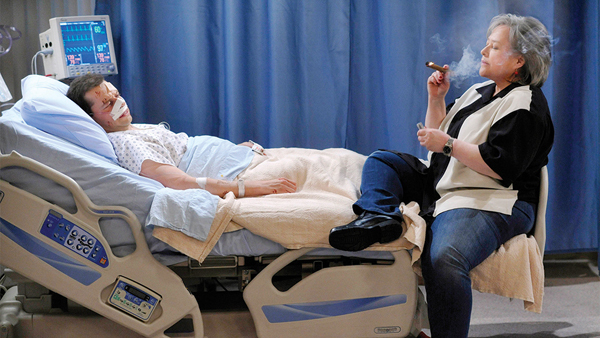 Charlie Sheen and Kathy Bates on Two and a Half Men. It seems Ruth has been a lifelong advocate for the legalization of marijuana, and she finally realizes her dream when she opens up Ruth’s Alternative Caring, a cannabis dispensary. Of course, Ruth partakes in a bit of the product herself. Kathy Bates serving up her own head in homage to one of her many roles on American Horror Story. Show creator Chuck Lorre (along with David Javerbaum who wrote for the “Daily Show” and “Colbert Report”) is sure to entertain the stoner in all of us with such show titles as Helium Dream, Donna Weed, Schrodinger’s Pot, Blue Dream, Eve’s Bush and 4/20 Fantasy.